Special Note: EC-CHAP recognizes the artistic talent and value of the gig poster and is pleased to provide a showing of this outstanding documentary produced by Avalanche Films. We wish to thank Johanna Goldstein, the producer who generously supports EC-CHAP screening of this film. 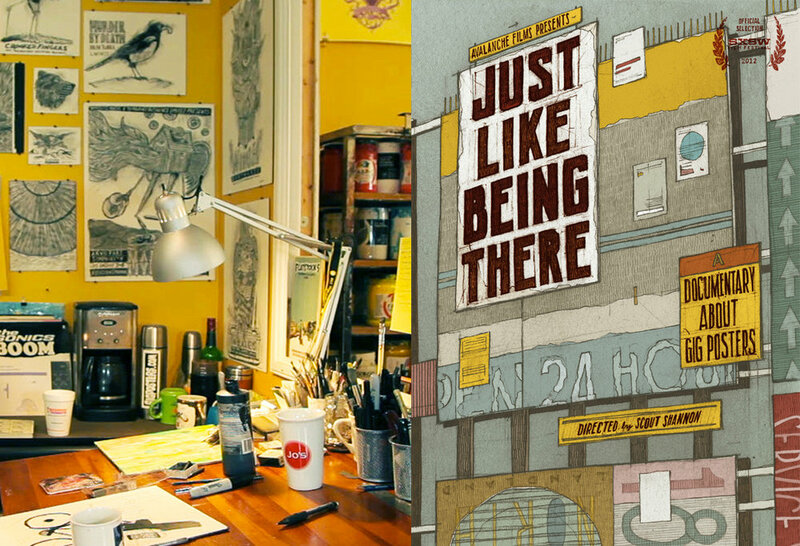 Just Like Being There (2013). A documentary about gig posters. Directed by Scout Shannon and produced by Johanna Goldstein. "Scout Shannon’s documentary on the rise of gig posters, Just Like Being There, offers a glimpse into the art of poster making, as well as the commercial recognition and benefits now being reaped by many of the artists. Their success may not be necessarily skyrocketing – it is an indie endeavor, after all – but the medium is certainly getting more attention and their work is being championed by bands, galleries and websites. In the gig poster community, artists such as Daniel Danger and Jay Ryan prove that creating this artwork is a way of life, more than just a career. These artists are at the forefront of an expansion of the gig poster genre. This film is a part of the EC-CHAP Friday Night Film Series hosted by the Eastern Connecticut Center for History, Art, and Performance (EC-CHAP), a 501.3.c non-profit membership-based cultural organization. To learn more and how you can become a member, visit www.ec-chap.org. Doors 7:00pm / Show 7:30pm. Soft drinks and snacks available. "BYOB&F" - Bring Your Own Beverage & Food (Wine & Beer Only - I.D. Required). You can also bring your paid ticket to Willington Pizza House (or WP Too) for eat-in or take-out the night of the show and receive 15% off your meal purchase. Ask for "The Packing House" pizza! Click here for secret recipe.